CLASSIC. 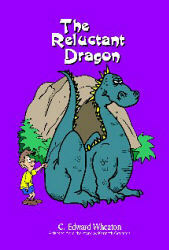 The Village of Hampton is in a panic after a dragon is discovered lying on the ground peacefully meditating. Since no villager is courageous enough to slay this “ferocious” beast, the villagers send for a knight. Curious to see the dragon for herself, Esmeralda meets the dragon face to face and discovers that this dragon doesn’t like to pillage, rampage, or fight knights. Instead, the dragon assures Esmeralda that he’s a “live and let live” kind of dragon who doesn’t have an enemy in the world and likes to write poetry. Since the dragon doesn’t know how to fight and isn’t even sure if he can belch fire, he begs Esmeralda to convince the knight that he is no menace. Instead, Esmeralda arranges for the knight to meet the dragon and the three come up with a clever plan sure to please the villagers. C. Edward Wheaton studied drama at Stanislaus State College and has an extensive background in 19th-century and early 20th-century American drama and literature. He lives in Stevinson, CA.